Here we have something that is a little different. It may seem a little simple and low key, but this pergola has just a ton of personality. 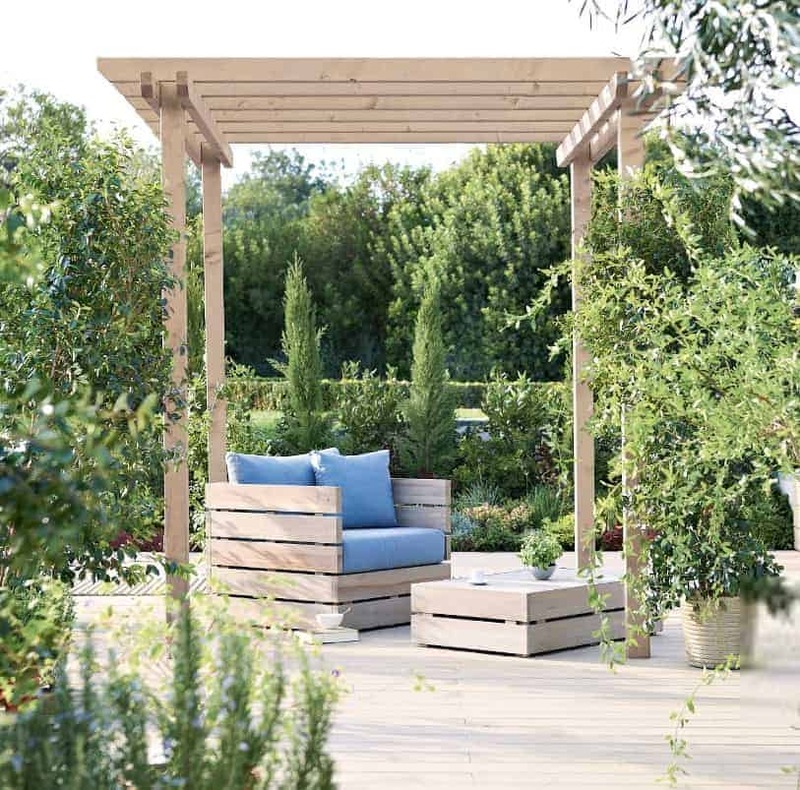 With four legs and a slatted top you could trail plants over the top and this will highlight a favourite area in the garden or even work as a feature over a small table and chairs which if you did have flowers on the top would give you a little shade from the sun. This is made out of pressure treated wood with a 15 year anti rot guarantee. This product is home delivered and will require you to assemble it. This pergola is the kind of thing that people who want something that is a little unique and different from what all the other gardens are doing should buy. It is well made and it is going to be standing tall for many years. One of the things that is great about this is how it has just so many uses. In the summer months it is going to look fantastic with flowers all over it and in the winter, we bet that this looks stunning with a coating of snow. In all this would be a great addition to your garden and it could very well be that last thing you need to finish it off. We have seen a number of fantastic products from the folks at Blooma, things like arbours, summerhouses and even swing seats, but nothing could have prepared us for the pleasant surprise that was their Blooma Rafter Wooden Pergola. This is such an interesting item an item that really could give your garden that little bit extra bit of style and give you that something extra you have been looking for to just finish off your garden nicely. 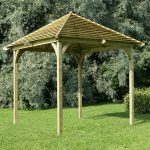 This pergola has a number of uses such as standing tall over a table, being just a feature in the middle of your garden or even being used as somewhere to hang plants. No matter what you have in mind for this we are sure that this is going to be up to the task of dealing with it. This is actually a fair bit larger than the pictures suggest. The width and the depth of the pergola are 6 feet 8 inches which is quite a respectable size. It is the height though that allows you to use this for a number of different things, as it stands at over 8 feet tall. There is a slatted top on here which we really do like. This idea behind this top is that you could put flowers on here and make a real feature of it. Being on the top, flowers would get an ideal amount of sunlight exposure and also provide you with a little bit of shade as well. Even if you did not have flowers on the top, we feel that a table and a chair under here would look really cool and stylish. 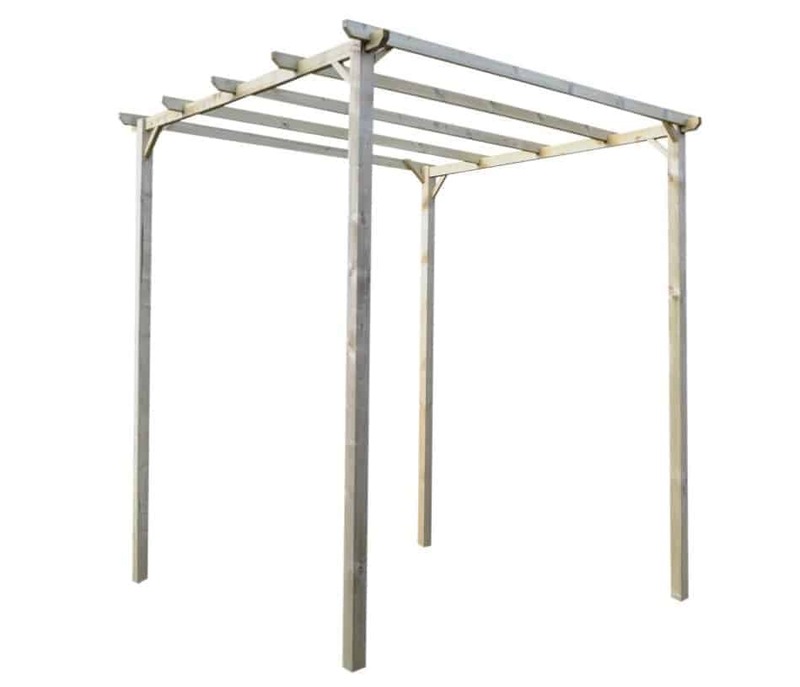 Interestingly there are only four legs that make up this pergola, but these are not just cheap wood they are pressure treated softwood and very thick so when the kids are running around the garden and if they bump into it the pergola will be fine, oh and we are sure your kids will be as well. There is not a frame on the lower part of the pergola, but if you take an eagle eyed look at the top of the pergola, you will see that the slatted top does not just sit on those four legs. Each leg is connected to another one with a set of high quality wooden beams and then the slatted top sits on top of these making it a very solid structure. This pergola is made to be placed directly on the ground. However we do know that some people may not be too keen on this so you could always dig a little and secure the bottom of the legs into the ground. Blooma are one of the very best out there when it comes to using fantastic pressure treated wood and we love how that is what they have used here. However, you will still want to give it a coating of wood treatment to give the pergola even more protection from rot. 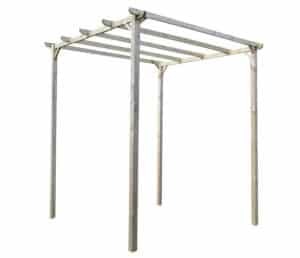 The Blooma Rafter Wooden Pergola comes with a 15 year anti rot guarantee. We do not see any signs of rot ever appearing on this as long as you treat it and treat it you must as this treating the wood is what makes the guarantee valid. Ok so we do not know if we should have called this area a walkway or a seating area as truth be told it could be used for both. You could have this right bang slap in the middle of your garden and decorated with flowers hanging from the legs, over the roof and anywhere else you can put them on and you could walk under this and it would be fantastic. Or you could put a chair and a little table under here and use it as something of a funky and cool little seating area. We know that the pictures do make this seem like it would it may not be the strongest structure in the world, but actually it is far more stable and secure than you would think. However like we said before if you are worried about stability then you could always sink those legs into the ground or anchor them down. If you do want to change the style of this pergola a little bit then the two most obvious ways that you can do this are first of all with a coating of paint. We are sure this would look fantastic in pretty much any colour. Also of course, you can make this come to life with a selection of flowers. So while, Blooma are not offering any customisation options, you can still have a lot of fun bringing this pergola to life in your own way. There are no extras being offered with this, but you may want to have a look into buying something to put on the bottom the legs if you do want to make it more secure on the ground. While it may not look it at first glance this pergola is actually very high quality. Impressively strong and pressure treated wood has been used and the design has been cleverly thought out so it is far stronger than you would think. This is going to last for many years due to how strong that pressure treated wood is. Also if you do remember to give it a coating of wood treatment and do it on an annual basis then wood will stay free from rot. This is far larger than the pictures suggest, you could easily fit a chair and table under here and the height makes it something that could stand in the middle of your garden and you will not bump your head when you try to walk under. This pergola is going to need two people to install it due to how tall it is. Also because of its height it can be a little fiddly to put it all together. We feel that this would be a great extra for any garden and no matter what you decide to use this for, we are sure that you are going to feel that you got great value for money. 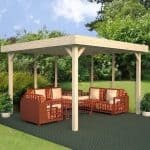 Final Thoughts: We really did not know what to expect the first time we had a look at the Blooma Rafter Wooden Pergola. However we can tell you that overall we are very impressed with this. We are impressed with just how strong and well made this is and also how it is going to be something which lasts for many, many years. Also the different things you can do with this such as covering it with a whole bunch of flowers or even just leaving it as it is make it something we like. Some of your more creative types we are sure are going to come up with all kinds of fun and interesting ideas to use this for. In all we really like this and feel that it would make for a very interesting and unique feature of any garden. When I came across this blooma pergola, I fell absolutely in love. I love the look of it. What I did when I got it was put plants over the top and clinging around the sides. It looks fantastic and it gives my backyard something extra. A 15-year anti-rot guarantee is worth it as well. We get a lot of rain where we live and I didn’t want to that to happen to us where it would get all rotted. What caught my attention with this wooden pergola was that it was pressure treated wood and it had a anti-rot guarantee. I bought this as a gift for my husband and my anniversary to ourselves. We have been wanting one of these for the longest time, or something like it. This has satisfied us for what we need it for. We can grow plants all down the side, and even plant flowers all around it.